1. The Jury Act of 1827 was opposed by many Indians. One of the grounds for opposing it was that it denied both to the Hindus and Mohammedans the honour of a seat on the Grand Jury. Which among the following was known for his opposition to the Jury Act? 3. Which one among the following prominently rose in revolt against the British in 1857? 5. Which one among the following statements is correct? 11. Who among the following was recently (May 2012) elected as Chair of the Asian Development Bank’s Board of Governors ? 1. Justice Dalveer Bhandari was recently elected as the President of International Court of Justice. 2. Justice Bhandari was a senior Judge of the Supreme Court of India. 1. All of them are winners of Dadasaheb Phalke Award. 2. While Tapan Sinha is a film director, VK Murthy is known for cinematography. 3. Soumitra Chatterjee was the last to get the Dadasaheb Phalke Award. 14. Who among the following was awarded the first Tagore Award for Cultural Harmony for the year 2012? 1. Service tax rate raised and covers all services including those in the negative list. 2. Increase in defence allocation over the previous year. 16. Suppose, the Naxalites have kidnapped a Deputy Commissioner from Baster region in Chhattisgarh and taken him to the Abujmad area. In return for his release, the Naxals demand that all Naxal prisoners must be released from jails across India. In such a situation which among the following may be the best conflict resolution mechanism? 1. The paramilitary and local police attack the Naxalites and attempt to release the kidnapped. 2. The state forces offer huge sums of money to the Naxals as ransom and release all Naxal prisoners. 3. The state forces engaged the Naxals in a dialogue while simul- taneously sending in a commando force to release the prisoners. 4. The state forces utilise local mediators to engage with the Naxals to work out a resolution process for release of the kidnapped. 17. A high level committee set up by the Ministry of Housing and Urban Poverty Alleviation conducted a survey of the slum populations in India’s states. Which one among the following states was identified as being the one with highest slum population ? 18. The UN has recently passed a resolution against human right violation in a South Asian country. Which of the following was the country? Which of the following labelled points in the figure given above indicate unstable state of an object ? 23. 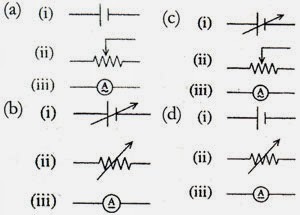 Which one among the following is an electrochemical cell that cannot be charged? 24. Which one among the following is the correct order of power consumption for light of equal intensity ? 27. Which one among the following statements about thermal conductivity is correct? 29. Which one among the following is the true representation of (i) variable DC potential, (ii) rheostat and (iii) AC ammeter respectively ? Red brood cells burst when placed in water. Due to the phenomenon of osmosis water enters into red blood cells. Indigo formed the basis of a flourishing sector of commercial agriculture by the beginning of the 19th century. The Indigo Commission was set up to enquire into the grievances of the indigo cultivators in 1860. 38. Which one among the following waterborne diseases is not caused by a bacteria? 41. Which one among the following parts of blood carries out the function of body defence ? 42. Which one among the following is not included in the major clinical sign as a case definition of AIDS in children andlt; 12 years of age? 44. Which one among the following is the hardest part of our body? 45. Which of the following group is present in animal cells? 46. Which one among the following statements is correct? 47. Which one among the following rocks does not belong to the same group?